Topical application of caffeine or caffeine sodium benzoate immediately after UVB irradiation augments UVB-induced apoptosis in the epidermis of SKH-1 hairless mice. Animal data indicate that caffeine administration inhibits UVB-induced carcinogenesis by functioning as a sunscreen as well as by enhancing UVB-induced apoptosis and apoptosis in UVB-induced tumors. The stimulatory effect of caffeine on UVB-induced apoptosis occurs by p53-dependent and p53-independent mechanisms. Inhibition of the ATR/Chk1 pathway by caffeine is a major contributor to caffeine inhibition of UVB-induced carcinogenesis. 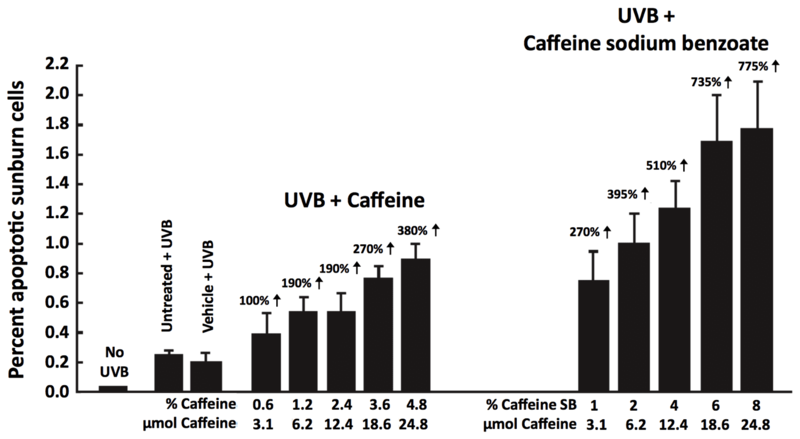 The inhibitory effects of caffeine on UVB-induced carcinogenesis in animal studies are paralleled by an inhibitory effect of regular but not decaffeinated coffee on non-melanoma skin cancer in humans. Sunlight-induced non-melanoma skin cancer is the most prevalent cancer in the United States with more than two million cases per year. Several studies have shown an inhibitory effect of caffeine administration on UVB-induced skin cancer in mice, and these studies are paralleled by epidemiology studies that indicate an inhibitory effect of coffee drinking on non-melanoma skin cancer in humans. Strikingly, decaffeinated coffee consumption had no such inhibitory effect. Mechanism studies indicate that caffeine has a sunscreen effect that inhibits UVB-induced formation of thymine dimers and sunburn lesions in the epidermis of mice. In addition, caffeine administration has a biological effect that enhances UVB-induced apoptosis thereby enhancing the elimination of damaged precancerous cells, and caffeine administration also enhances apoptosis in tumors. Caffeine administration enhances UVB-induced apoptosis by p53-dependent and p53-independent mechanisms. Exploration of the p53-independent effect indicated that caffeine administration enhanced UVB-induced apoptosis by inhibiting the UVB-induced increase in ATR-mediated formation of phospho-Chk1 (Ser345) and abolishing the UVB-induced decrease in cyclin B1 which resulted in caffeine-induced premature and lethal mitosis in mouse skin. In studies with cultured primary human keratinocytes, inhibition of ATR with siRNA against ATR inhibited Chk1 phosphorylation and enhanced UVB-induced apoptosis. Transgenic mice with decreased epidermal ATR function that were irradiated chronically with UVB had 69% fewer tumors at the end of the study compared with irradiated littermate controls with normal ATR function. These results, which indicate that genetic inhibition of ATR (like pharmacologic inhibition of ATR via caffeine) inhibits UVB-induced carcinogenesis support the concept that ATR-mediated phosphorylation of Chk1 is an important target for caffeine’s inhibitory effect on UVB-induced carcinogenesis.